The Guidelines for the Assessment of General Damages are designed to provide a clear and logical framework for the assessment of damages in personal injury cases. 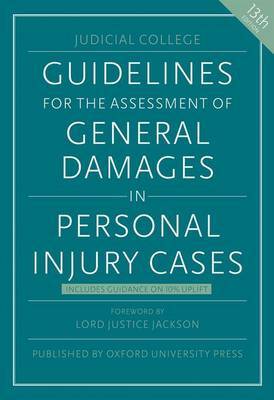 The first edition of this title was regarded as a landmark in personal injury practice. Each succeeding issue has built on this reputation and the book has now firmly established itself as essential reading for all those involved in the area of personal injury litigation. This new edition has been fully updated to take into account inflation since the last edition as well as reflect decisions of the higher courts on quantum. It also continues to include an additional column of figures indicating the 10% uplift in general damages recommended by Sir Rupert Jackson and endorsed by the Court of Appeal in Simmons v Castle  EWCA Civ 1288. As with previous editions, all judges involved in hearing personal injury cases will automatically receive a copy of the book.